UN, February 25. /TASS/. 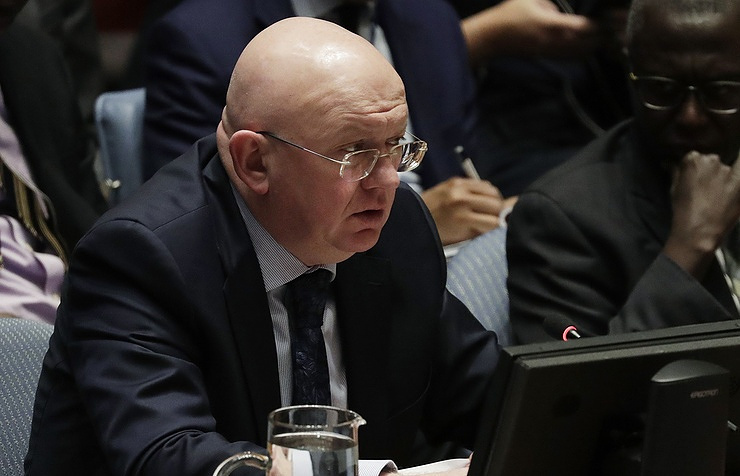 The US military presence in Syria is aimed at solving "geopolitical issues of doubtful legitimacy," Russia’s UN envoy, Vasily Nebenzya, told the UN Security Council on Saturday. "The aim of fighting with terrorists should not become a disguise for solving this or that geopolitical issue of doubtful legitimacy, which is exactly what the United States is currently doing in Syria," the Russian diplomat said after the unanimous UN Security Council vote to adopt a resolution on Syrian ceasefire. Nebenzya said the ceasefire agreement is not applicable to counter-terrorism operations, adding that they must be held in coordination with the Damascus government. He advised the US delegation to "save their rhetoric regarding Russia" and promised that next time he would count how many times US ambassador to the UN, Nikki Haley, mentions Russia in her speech. "We insist that the so-called coalition stop its occupational ambitions. Among other things, this will clearly contribute to improving the humanitarian situation. It would allow the Syrian government to start returning to peaceful life in all territories liberated from terrorists, including in the north and east of the country," he said. US President Donald Trump said on Friday that US military presence in Syria is aimed solely at fighting the Islamic State terrorist group (outlawed in Russia) and that the US servicemen will be withdrawn once this goal is achieved. Trump’s statement runs counter to statements by US Secretary of State Rex Tillerson, who admitted in January that Washington plans to retain its military presence in Syria even after the defeat of the Islamic State. On Saturday, the United Nations Security Council in a unanimous vote approved the resolution demanding a 30-day ceasefire across Syria to allow aid access to the population. According to the co-authors of the document, Kuwait and Sweden, this move will improve humanitarian situation in Eastern Ghouta, a militant-controlled suburb of Damascus currently under siege by the government forces. 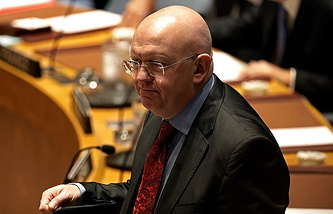 Nebenzya said the humanitarian crisis in Syria is not limited to Eastern Ghouta alone. "We are aware that the humanitarian situation in Syria is very difficult and requires immediate measures, but we see perfectly well that the propaganda scenario surrounding Eastern Ghouta fully corresponds to the campaign launched during the counter-terrorist operation to liberate East Aleppo in late 2016. We should focus not only on Eastern Ghouta, but also on Raqqa, al-Rukban, Al-Fu'ah, Kafriya and Yarmouk. Aid must be sent to all regions of Syria," the diplomat said.